Above: The picture above shows a premium quality Spotted Rubber Lip Plecostomus, swimming in one of our aquariums, when one of us took this picture. Comments: This is a Premium Pet Fish, and we never see Premium Fish like this in any of the live fish stores or in the online stores that we visit. Premium Pet Fish are more energetic, hardier, and have brighter colors with a beautiful metallic sheen. Click here to learn more about Premium Pet Fish. Origin: This Plecostomus was caught in the Colombia, and it ranges throughout South America. Maximum Size: This Plecostomus can grow to be over 6" long, including their tails. Sometimes very old plecos can get even longer. Behaviors: They will usually move around pretty actively during the day, but some of them seem to hide during the day and become more active at night. But if there is food to be eaten, they become very active looking for it. Compatibility: Some recommended tank mates include any community fish. Click here to read more about compatible groups of pet fish. Temperature: They live well from about 78 to 82 degrees F., but they're probably most comfortable at about 78 degrees F.
Click here to learn about aquarium temperature, aquarium thermometers, and aquarium heaters. Feeding: Premium Fish Food Flakes when very small and small Premium Pellet Food when larger. Click here to learn more about and shop online for premium fish foods. Water Conditions: This Plecostomus seems to be tolerant of a wide range of water conditions. Probably a pH of about 6.5 with moderate hardness is best. Most water in the US seems to be OK, so it's probably best NOT to adjust the pH or the hardness of the water. Here in our facilities the water is hard and the pH is usually about 7.8. We ship them in this water. Click here for a lot more information about aquarium water conditions. Aquarium Size: It is probably best to house these fish in at least a 30-gallon tank, when they're less than 3" long, but a bigger aquarium is always better. Allow at least 5-gallons of water for each Plecostomus under 3" long. They'll eat a huge amount of food and grow very fast. At about 3" they should be moved into a 60-gallon aquarium. Decor: These Catfish do not need gravel, and a layer of gravel more than 1/4" thick will usually fill with bits of uneaten food that will contaminate the water. Click here for more about aquarium gravel. Pieces of aquarium-safe driftwood are also nice. Live Plants are beautiful and improve the water quality. Aquarium Filter: Bio-Wheel Filters are highly recommended. A Penguin 350 in an aquarium with 40-gallons of water is OK to start with a few of these Catfish that are less than 3" long. At 3" long they should be moved into a 60-gallon aquarium with two Penguin 350B Filters. Click here to learn more about aquarium filters. The addition of Lava Rocks will keep nitrates in the ideal range. Click here to learn more about using Lava Rocks in aquariums. Life Span: These Plecostomus can live for several years, probably many years provided they are fed premium food and kept in a very large aquarium with very fresh water. Gender: As they mature females presumably become plumper than males, and males will grow long bristles on their nose. Breeding: These Plecostomus have been successfully bred in the aquarium hobby. 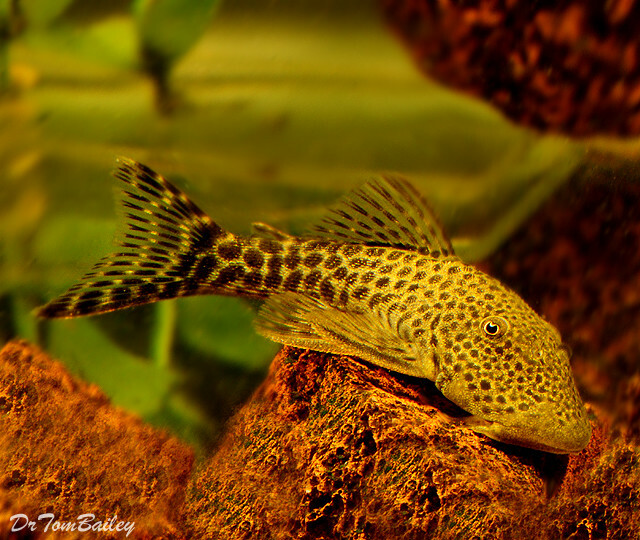 Popularity: This Plecostomus is common and very popular. Names: The scientific name is Chaetostoma milesi. Variations: This Plecostomus lives across a wide range in South America and their pattern of markings vary geographically. We hope you've enjoyed reading these comments.